Jerome Wright brilliantly conducts the Seattle Girls’ Choir Prime Voci in this 70-minute CD from SDG Records®. Appearing with the choir is pianist/composer Jackson Berkey along with top instrumentalists from the Pacific Northwest. The exuberant downbeat of the Gloria in excelsis Deo! tells you instantly that you’re in the midst of expert music making. What follows is a sublime journey in beauty. Unexpected beauty of choral sound from such young singers. Beauty of instrumental gesture. Beauty of impeccable performances. Premiere recordings of South Dakota Shadows Suite and “The Song of Solomon. A “gangbusters” performance of Sacramento Sis-Joe (with mallet instruments and piano four-hands) segues to the gentle Little Fire with piano and harp. Still, Still Night and Come, Thou Long-expected Jesus receive especially beautiful readings featuring the harp playing of Juliet Stratton. 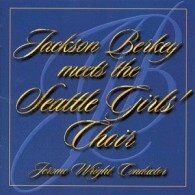 The Seattle Girls’ Choir CD program closes with the premiere recording of Berkey’s Thoughts and Remembrances. This revealing work was written to celebrate the lives of Jackson’s and his lady Almeda’s mothers, both of whom died in 1994. Jerome and Jackson’s collaboration here is soul-stirring. Included are the ethereal Isaiah 44:3 and the setting of Thomas Campion’s poem View Me, Lord, A Work of Thine. The dramatic 6Pence provides an unexpected release of laughter and joviality; Balm in Gilead soothes the mind and soul. Jackson Berkey meets the Seattle Girls’ Choir. Much of the music was set specifically for this premiere American treble force. One spin of the CD immediately reveals why.